Maria Leandra Reyes fought to hold back tears as she recalled the tragic death of her good friend Jesus Valderrama and her recent search for his relatives. Valderrama, a 62-year-old native of Chihuahua Mexico, was killed at around 10:20 a.m., Mar. 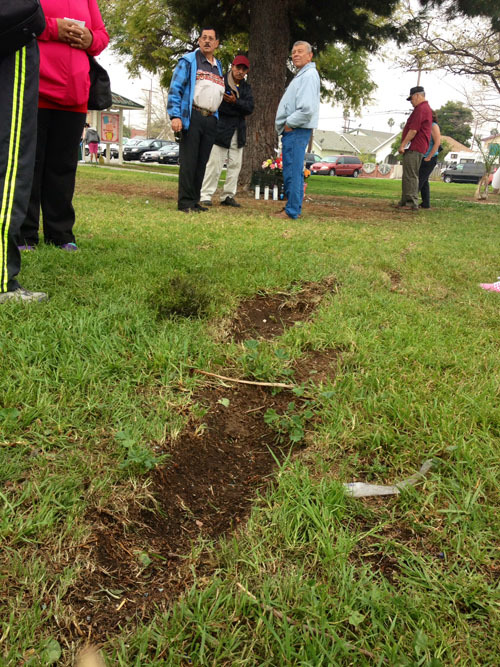 10 when a 2003 Honda Accord traveling west on Whittier Boulevard near South Ditman Avenue jumped the curb and struck him as he slept under a tree outside the Ruben Salazar Senior Center in unincorporated East Los Angeles. Reyes was not at the park at the time of the accident and says she was shocked when she heard the news. It had been just a few hours since they last saw each other, she recalled. “He must have had a feeling something was going on because he gave me his cell phone and he said that he loved me very much,” she said in Spanish, still visibly shaken. Chuy—as friends called him—was like a father to me, she told EGP. Feeling an obligation to notify Chuy’s family in Mexico of his death and to arrange for his burial, Reyes said she had little time to mourn the passing of her friend. Chuy’s only family in Los Angeles was a brother living in a convalescent hospital and when Reyes attempted to notify him about the death the hospital advised against it: “The nurse said the news could kill him,” Reyes said. The only emergency contact information the hospital had on record was a disconnected, out of state phone number, she said. Not knowing where else to go, she headed to the Mexican Consulate in Los Angeles for help, where she encountered more obstacles because she is not a relative. The Consulate offers a variety of services to Mexican nationals living in the U.S., including notifying next of kin of a death or in some cases, transporting the deceased back to Mexico. “We try to contact family members in Mexico and we look for options” to assist them when these tragedies occur, explains Consulate spokesperson Sergio Juarez. It was ultimately Reyes, however, who located a brother of Chuy’s in Mexico and delivered the tragic news to his family. 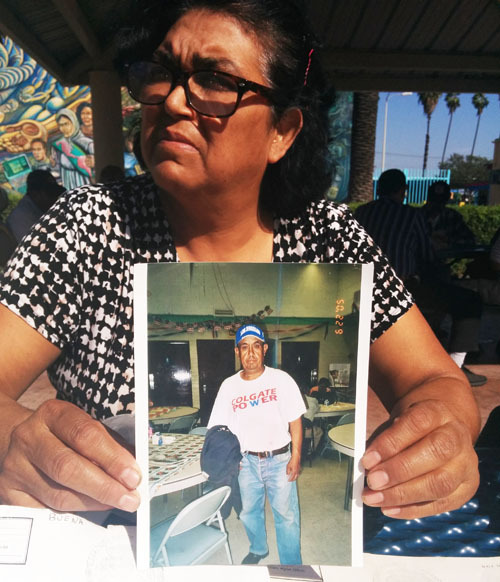 Last Friday, Ramon Valderrama flew to Los Angeles and on Monday he went to the Mexican Consulate to seek help arranging his brother’s funeral. “We will receive $1,700 [to help] with the funeral services,” Ramon told EGP by telephone Tuesday. The Mexican Consulate’s “Traslado de Restos” (Shipping of Mortal Remains) program contracts with mortuaries in Mexico – including embalming, casket — and shipping to Mexico, which can cost over $2,000. The process can take several days, said Juarez, who also explained the deceased is flown to either Mexico City or Guadalajara and from there driven to his or her final destination. Cremation, without a burial, is less expensive, costing about $1,000. Chuy’s story illustrates the importance of making sure someone local knows how to contact your family in case of an emergency or your death, since only an immediate family member — spouse, child or parents—can solicit help from the Mexican Consulate, which requires proof family members and the deceased are Mexican nationals, Juarez said. Valid documents accepted are a birth certificate, Mexican passport or draft card. As previously reported by EGP, the Mexican Consulate can also assist family members obtain a humanitarian visa to travel to the U.S. in the event of an emergency, such as a grave illness or death. “[Family members] just need their Mexican passport and the official letter on letterhead from the mortuary with specific information” about the deceased person in the U.S., said Juarez. In the meantime, Reyes and some of Chuy’s other friends — many frequent visitors to Salazar Park Senior Center — are collecting donations to help defray burial costs. Donation boxes have been placed in nearby businesses, Reyes said. Many regular park goers were there at the time of the accident and some are still very shaken up by the tragedy, according to park officials. Andre Herndon, public information officer for the county’s parks and recreation department, told EGP they immediately notified the Dept. of Mental Health to provide crisis counseling to seniors and others affected by the accident. Staff reached out to the people who saw the accident and so far two people have requested counseling, Herndon said. Because it can take weeks for flashbacks and other stresses related to the incident to occur, counseling will be available indefinitely, Herndon said. Those who need help can call (800) 854-7771, 24 hours, seven days a week. According to Reyes, Salazar Senior Center was Valderrama’s favorite place to hang out. He’d go play pool and he liked to relax on the grass outside of the center, she said. “I never thought Chuy would be killed this way,” she said sadly. She would tell Chuy, “don’t sleep on the grass” or to go home because he could be shot—with so much gang activity around, Reyes said. If you or someone you know needs help in a similar case, call the Mexican Consulate’s Department of Protection at (213) 351-6800 ext. 2405 or visit 2401 West 6th Street, LA 90057. March 26, 2015 Copyright © 2012 Eastern Group Publications, Inc.
R.I.P Senior Chuy, que este con Dios en su Gloria.